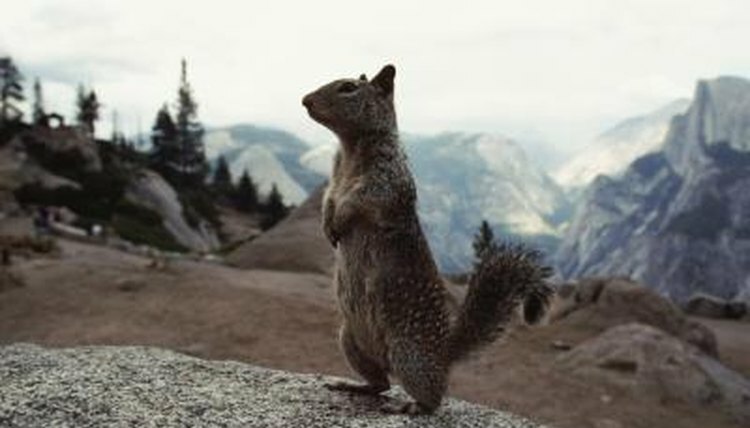 Most squirrels, members of the family Sciuridae, make several sounds, although the type and amount of noise they make vary by species. They generally vocalize to each other and to intruders. Gray squirrels have a variety of identifiable vocal noises. If you become familiar with them you can tell what the squirrels are saying. Squirrel sounds and their volume depend on the circumstances and on the squirrel's age and gender. One night-active squirrel species makes little noise. In addition to vocal sounds, squirrels chatter their teeth. This signals aggression and a squirrel making this warning may bite if you get close, the "Washington Post" reports. Many squirrels also communicate with tail movements and foot stamping. Most species of squirrels are active during the day, especially at dawn and dusk. Flying squirrels, a nocturnal species, tend to live in silence, although they do make a soft, high-pitched sound similar to a bird's "tick-tick" call, according to the Washington Department of Fish and Wildlife. Flying squirrels can communicate with each other ultrasonically (at frequencies above the range audible to humans). When first alarmed, a squirrel waves its tail. If the source of alarm continues, such as if a predator continues to approach, the squirrel makes warning calls. These calls tend to continue while the threat is present. The alarm cries warn other squirrels of danger and also communicate to the predator that the squirrel sees it. Lishak observed that cats give up stalking squirrels after this call because the squirrel's alert means the hunter has lost the advantage of surprise. A gray squirrel's "kuk" call changes to a "quaa" and becomes quieter once the threat moves out of the squirrel's sight. Douglass squirrels and red squirrels produce a fast, repeated "tsik tsik tsik, chrrrrrrrr -- siew siew siew siew" noise when they're disturbed. A male gray squirrel imitates the sounds baby squirrels make to ask for milk when he wants to mate. He'll chase a female when she's in estrus, the time when she's receptive to mating and can reproduce. These soft sounds, written as "muk-muk," resemble a held-in sneeze. They're intended to reassure her that he's not a threat. Female squirrels make moans, "kuks" and "quas" before and after mating. Baby squirrels give the adult male his model for being nonthreatening when approaching a female by making a soft "muk-muk" sound when they're hungry. Squirrels are born defenseless and their quiet baby sounds may help reduce their risk of attracting predators. The mother gray squirrel nurses her young for up to 70 days. The young will make shrill cries when alarmed. These higher-pitched cries have a better chance of reaching their mother.